We all are expected to learn some basic skills which improve our presentation, and help us fulfill our mission. Some will excel in some of the skills, but we all learn the basics. Everyone needs to learn how to card wool and spin it with a drop spindle. Sewing of a basic nature is needed to repair your clothing, if not make some of the basic pieces. Some basic chip carving is needed to mark your wooden goods. 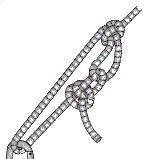 As a seafaring people, we need to need some rope handling, including a square knot, half hitch, clove hitch (double half hitch), bowline, bowline on a bight, figure eight, sheepshank, sheet bend, tautline hitch, and a trucker's hitch, some basic lashing, and a back splice, in-line splice, and eye splice. Other skills learned in MacColin are by interest, including boat making, black powder firearms, blade handling, pole arms, baking with charcoal, and blarneying unsuspecting customers into learning just how heavy chain mail is! These knots, bends, and hitches, and some basic lashing take care of most of our needs. Splices are strong and permanent. All of us need to know these, the basic ones. Back splice: protects the end of the line (and your hands). Eye splice: for a loops, often used for gates. 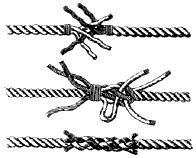 In-line splice: for joining of two lines into a longer one.